Lydia Lousteaux interviews Richard Nugent, an enthusiastic Asteroid Hunter and Eclipse Chaser. Richard was born in New York in 1955. He has been working with IOTA (International Occultation Timing Association) officially for 10 years. An asteroid occultation occurs when an asteroid, moving in its orbit around the Sun, happens to be in alignment with the Earth and a star. Thus the asteroid eclipses the star. The event only occurs along a narrow path on the ground. Timing the duration of these occultations helps astronomers determine the size and shape of the asteroid to unprecedented accuracy. Several hundred asteroid shape profiles have been determined by this method. Unofficially Richard has been chasing asteroids since the 1970s. He graduated from the University of Florida in 1979 and wrote his Masters thesis on An Astrometric Study of NGC 752. Richard studied under Professor Heinrich Eichhorn. "Professor Eichhorn was chairman of the astronomy department for the University of Florida, my thesis supervisor and mentor. He was the top person in his field in the world for positional astronomy and star catalogues and a consultant for the government agencies and military, back in the 1950s and 1960s when accurate star positions were needed for satellite observations. "I admired him from the day we met. He hated certain academic programs (considered them a waste of money) and was never afraid to speak his mind. When Dr. Eichhorn passed away in 1999, testimonials came in from all over the world about his greatness and notability." 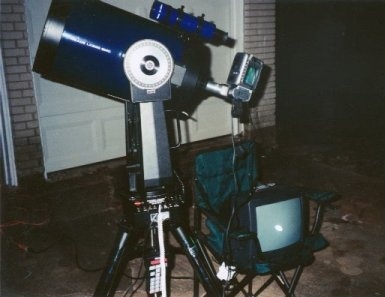 Richard's telescope setup - impressive, eh? I asked Richard what he considers to be some of his greatest achievements in astronomy. "I would rate the journeys to various umbral limit sites (northern and southern eclipse limits) to observe and record the Baily's Beads effect for IOTA." Richard's varied ventures in solar eclipse chasing has allowed him to criss-cross the Earth several times, by boat, by air, and on foot. The only continent he hasn't yet visited is Antarctica! At the time of this interview, Richard was packing for Africa to further his compilation of scientific data on Baily's Beads and you will next find him in Costa Rica in December. "I spent two weeks at Mt. Evans in Colorado at the highest operating optical observatory on Earth (Meyer-Womble Observatory, with twin 28.5 inch reflectors) at 14,150 feet. I was attempting to get CCD images of some ancient reported novae in the hopes of seeing gaseous remnants. Unfortunately equipment and weather problems foiled my efforts." Richard explains the importance of observing the Sun through its eclipsed stages: "The northern and southern eclipse limit observations are combined to derive the diameter of the Sun. 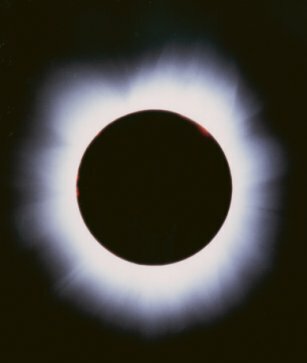 The Sun's diameter does not appear to be constant as once thought, so the eclipse observations are important to determine if the Sun's changing size is part of the solar cycle or another sub cycle. "Calculations compiled from these events have made it possible to determine the Sun's diameter to several hundredths of an arc second." He follows up this data with: "Twenty years of data has shown us that the Sun may be shrinking." Taken at 3:01pm 21/06/01 Chinyingi, Zambia with an Elite 200, Meade 2045D 1 sec. In addition to what he has done on the subject of solar eclipses, Richard mentions his many asteroid occultation expeditions for IOTA, some successful: "The results of these successful occultations determine the size and shape of the particular asteroids being observed, a technique used long before any space probe began photographing them on its long voyage to Jupiter and Saturn. "In January 2000, we flew to Oklahoma to observe two asteroid occultation events in one night. The first, 308 Polyxo, was successful and I observed a 22.4-second occultation. The second event of 283 Emma a few hours later and 2 miles further north was foiled during the critical 30-second window of the event when a police car drove up and his headlights ruined the observation. Two successful occultations in one night would have been a record." I asked Richard what he thought of the differences between amateur and professional astronomers and their separate contributions to science and the public knowledge. "Both push their equipment to the limit, collect data and carry out extensive observations. The pro's contributions are largely the result of their advanced equipment, and are published on the internet and professional journals. Amateurs spread the word about astronomy at the local (public) level keeping interests alive and well. "The difference in their contributions is mainly the capability of their equipment - if the amateurs had the big telescopes and sensitive detectors, they would be cranking out the same type of results (on a learning curve of course). As you know amateurs are catching up with the pros in certain fields, and surpassing them in others - (such as) - asteroid discoveries, novae, supernovae, variable stars, occultation events, fireballs, meteors, planetary observations, satellite passes, and other unique events. In these and other fields, amateurs and pros work together." Here, Richard threw in: "You know, there's a restaurant on the Moon!" He caught this interviewer totally off guard with that statement, and took advantage of the sudden seconds of silence by quickly adding: "The food's great but people don't go there much because there's no atmosphere!" "I am also interested in using new high precision star catalogue positional data in re-examining distances to certain star clusters and other objects of interest."